Six months in one blog! 3 – you turned one in December, my dear lovely boy. You’re growing up so fast. 4 – we took a holiday to France last month (April) and you loved all the food- especially sneaked bits of Mummy’s chocolate crepes and ice creams! The first of many family holidays, it was fabulous to spend an entire week with you! 5 – you’re going to be a cousin really soon- little one due this month. Hope they have as much fun and enjoyment as we’ve done. It has been lovely to pass on your baby things for them to use. You’ll have to teach your little cousin how to do lots of things, I really hope you’ll be the best of friends despite the distance. This entry was posted in Elliot, Family, Nursery, Story. Bookmark the permalink. 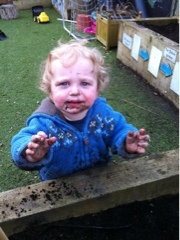 Really sweet picture of Elliot – I see he has learned to merge his feeding and gardening skills and did a bit of soil tasting ;-)Happy to hear the work/childcare combination is working out. Would love for L's grandparents to be around – fulltime nursery care is not ideal, I think.